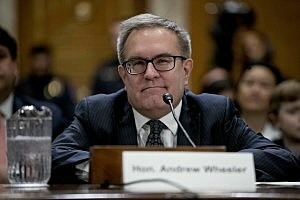 The Senate Committee on Environmental and Public Works questioned Wheeler, who fielded questions amid protester interjections for nearly three hours, as part of his confirmation to become the agency’s permanent chief. A line of environmental activists snaked around the fourth floor of the Dirksen Senate Building as early as 8 a.m. in anticipation for the hearing, including many women clad in red “Mothers Clean Air Force” T-shirts, children in tow. Not 20 minutes into the talks, a couple shouting “shut down Wheeler, not the EPA,” were escorted out the doors. The roaring chant – picked up by other members of the activist group Friends of the Earth Action – continued outside through Wheeler’s opening statement. Wheeler, who worked at the EPA in the early 90s and as a former energy lobbyist, was named acting administrator of the EPA in April 2018. He took over for scandal-ridden Scott Pruitt, who resigned in a swirl of ethics violations including his alleged penchant for personal favors and bodyguards. While there was bipartisan support for Wheeler as a seemingly vast improvement over Pruitt, his rollbacks of Obama-era regulations, including rules regulating the disposal of toxic coal ash and power plant mercury emissions, have alarmed critics of his ascension. John Barrasso, a Wyoming Republican and chairman of the committee, began the hearing outlining what he called Wheeler’s “outstanding” job as acting head of the EPA, particularly his programs aimed at regulating lead exposure. Democrats on the committee doubled down on how those policies – particularly the rollback of regulations, including those aimed at reducing greenhouse gas emissions – could exacerbate climate change. Senator Bernie Sanders of Vermont, an Independent who caucuses with Democrats, set the tone for Democratic questioning. “President Trump has indicated his belief that climate change is a hoax, perhaps perpetrated by the Chinese. Do you agree?” Sanders asked. “I do not use the ‘hoax’ word myself,” Wheeler answered. Wheeler attributed last year’s 3.4 percent rise in U.S. carbon dioxide emissions to an especially cold winter and hot summer while defending the EPA’s continuing plans to reduce carbon emissions by 35 percent from 2005 levels by the year 2030. Referencing an October report on global greenhouse gas emissions from the United Nations Intergovernmental Panel on Climate Change, Senator Cory Booker, D-N.J., derided Wheeler’s efforts. Sheldon Whitehouse, a Democrat from Rhode Island, held fast to the issue, saying the EPA’s own analysis of Wheeler’s proposed Corporate Average Fuel Economy (CAFE) standards – the measurement of vehicle fuel efficiencies – has CO2 emissions rising almost 9 percent higher than baseline levels. Whitehouse also asked Wheeler how many meetings he arranged for or attended with between coal magnate Robert Murray and Trump administration officials, delving into Wheeler’s coal past. But Republicans countered the coal narrative, and focused on Wheeler’s track record as a former EPA career employee, calling attention to his lengthy tenure and honors while working for the agency across two presidential administrations. There was bipartisan agreement over the negative impacts of the government shutdown now in its 26th day, making it the longest in U.S. history. Nearly every senator took time to comment on the “tragic” shutdown, with some wondering how Wheeler will follow through with promises without a viable workforce. Republican Senators Joni Ernst of Iowa and Mike Rounds of South Dakota both reminded Wheeler of promises to finalize E15 fuel regulations by “summer driving season,” despite the ongoing shutdown. Wheeler assured Rounds that “as of today, yes,” the regulations could be finalized, but qualified his answer by reiterating the difficulty of moving things forward during a shutdown.